@SimonHearne • Optimizing for Low Powered Devices • Velocity New York 2016 14 Your users’ expectations are set by their most recent interactions. @SimonHearne • Optimizing for Low Powered Devices • Velocity New York 2016 16 Mobile users are not patient. @SimonHearne • Optimizing for Low Powered Devices • Velocity New York 2016 17 53% The need for mobile speed. DoubleClick, September 2016 . of visits are abandoned if a mobile page takes over three seconds Mobile users are not patient. end devices can perform poorly. income users get a poorer web experience? @SimonHearne • Optimizing for Low Powered Devices • Velocity New York 2016 84 Beware of onBeforeUnload 250ms input latency! @SimonHearne • Optimizing for Low Powered Devices • Velocity New York 2016 85 RULE 4 Measure and Monitor CPU Usage Including page interactions! 86 We Don’t Have the Tools You can’t manage what you don’t measure. @SimonHearne • Optimizing for Low Powered Devices • Velocity New York 2016 92 Use Real Data! @SimonHearne • Optimizing for Low Powered Devices • Velocity New York 2016 101 back to m.
@SimonHearne • Optimizing for Low Powered Devices • Velocity New York 2016 102 b ack to m. without the m.
Thank You @SimonHearne simon@hearne.me webperf.ninja / Stay in touch! 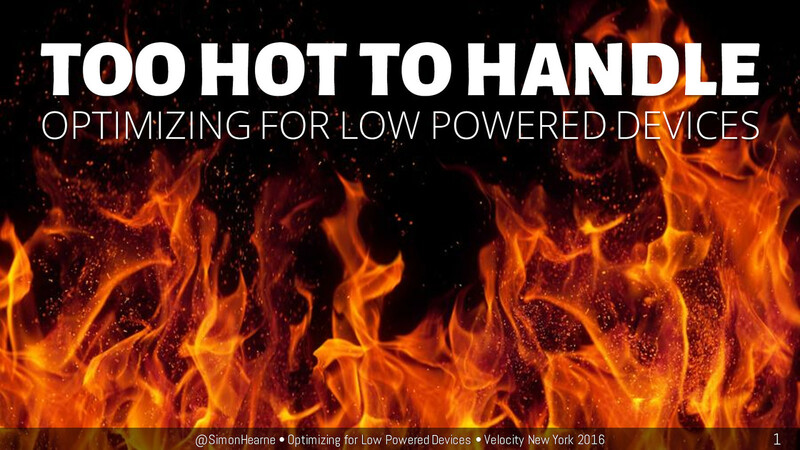 View Too hot to handle: Optimizing for low-powered devices on Notist. We know what web performance is—getting pages to render fast for as many customers as possible. Traditionally, the focus has been on the network, improving the time to deliver critical content, but the combination of modern web applications, better network connectivity, and HTTP/2 is reducing the impact of the network on site speed. Our next great challenge is how well our applications perform on our customer’s CPU. As our dependency on the CPU has inevitably increased, our devices have gotten smaller, and processors have struggled to keep up with Moore’s Law. Meanwhile, our ability to profile and analyze the CPU footprint of our web applications has barely improved beyond the timeline in Chrome’s Developer Tools. Simon Hearne explains why the CPU will soon be the biggest challenge for web performance (if it isn’t already), explores the many tasks that now rely on the CPU and the impact that these have on user experience, and demonstrates how to profile CPU usage to find issues and limit their impact as well as how to manage CPU load at scale to ensure that every customer gets a good experience, regardless of gigahertz. Potentially compounding the additional load on our customers’ processors is our move to richer web technologies. We create intricate images and animations in CSS3 and SVG that were previously only possible with video. Web sockets, WebRTC, and service workers allow us to do much more with real-time communication. High-resolution images look great on large screens but can weigh heavily on a CPU when they need to be scaled. All of these advancements create increasing demand on web browsers at a moment when we have an ever-decreasing slice of our customer’s CPU thanks to multitasking across tabs and applications.